The Daihatsu Company was formed in 1907 as the Osaka Motor Manufacturing Co. Ltd. Its first vehicles, in 1930, were small 3-wheeled commercial delivery trucks sold under the names Daihatsu or Tsubasa. 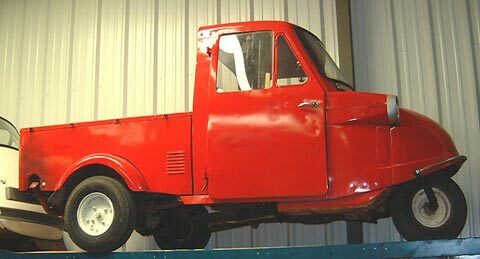 In 1951 it changed its name to Daihatsu Kogyo Kabushiki Kaisha, and during the '50's and '60's it produced a wide range of commercial vehicles. Its earlier vehicles were handlebar-steered. Its products were a great success, both in Japan and other Asian markets. 1954 brought the first passenger car, called the "Bee", which was derived from a three-wheeler commercial chassis and powered by a 250cc motor. These three-wheelers were also available as taxis, for which there was a tax reduction of 40% compared to a four-wheeler. 1962 brought the first four-wheeled car- the 700. 1966 saw a one-third controlling interest by Toyota, and the make went from strength to strength from then on. The cute little Trimobile enjoyed success because its seating position was that of a real car, not an adaptation of a motorcycle. Weight: 415 kg Electrics: 12 v 3 Wheels: 5.00 x 9"